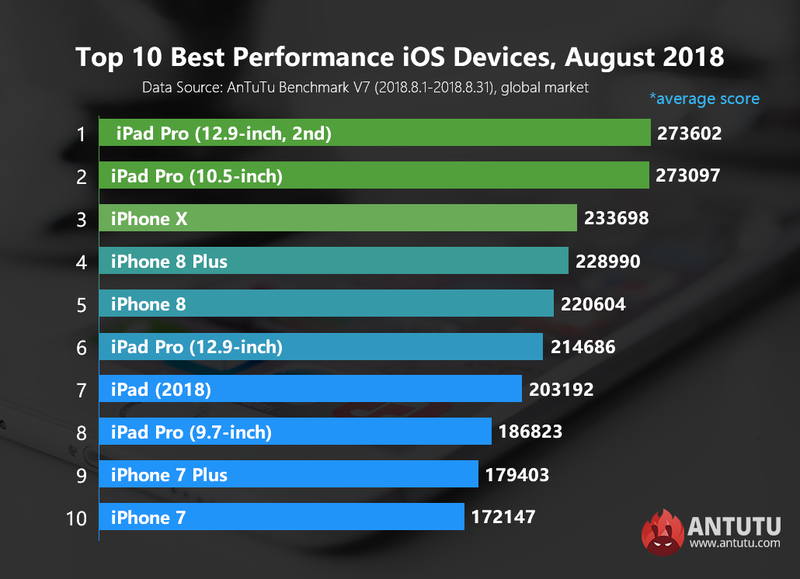 Today it’s time for Antutu to reveal our most updated benchmark results for the 10 best performance iOS devices for August 2018. What are the best iOS devices on the market right now? Check out our most updated top 10 ranking list as measured by the average Antutu score. Since the new iPhones have not been launched yet, the rankings of this month don’t show much fluctuation compared to that of last month, with A10X processor still occupying the first place on the list. According to our August ranking, the first place goes to the 12.9-inch iPad Pro(2nd generation) once again with an average Antutu score of 273,602, followed closely by the 10.5-inch iPad Pro with an average Antutu score of 273,097. Since the two models are both powered by the Apple A10X processor and have similar specs, the score difference is only marginal. Coming in third, fourth and fifth place after the 12.9-inch iPad Pro and 10.5-inch iPad Pro are iPhone X，iPhone 8 Plus and iPhone 8 with an average Antutu score of 233,698, 228,990 and 220,604 respectively. In particular, both iPhone X and iPhone 8 Plus have 3GB of RAM, allowing them to deliver better performance than iPhone 8 which has only 2GB of RAM. Making up the rest of this month's Top 10 are the 12.9-inch iPad Pro(1st generation), iPad (2018), 9.7-inch iPad Pro, iPhone 7 Plus, iPhone 7 and 2017 iPad. Apple will launch its next generation iPhones in a few days. Hopefully, the new iPhones will all be powered by the brand new A12 processor, which will bring performance increase to the new iPhones. We expect to see changes to the ranking list of next month. The above data reflects the changes of the performance of iOS devices for August 2018. For more information about the ranking list, please visit Antutu official website or download AnTuTu Benchmark and check in the menu of “Ranking”.